Make an informed choice from suitable knives for children and young people. Photo: Barry Smith. A knife is an important tool in the woods. 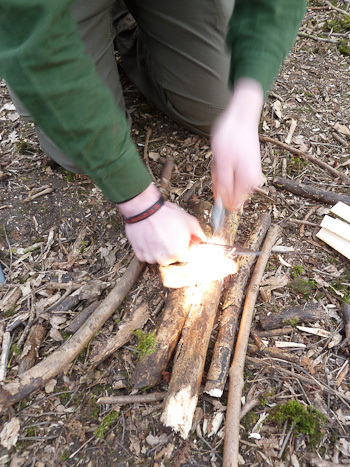 When teaching youngsters bushcraft skills - or starting to learn the skills yourself - it's important to select the right tool for the job. The are a plethora of 'Bushcraft' and 'Survival' knives on the market, so choosing the right one can be a daunting task. Something safe, reliable and value for money is a good place to start. In this article I explain the features to look out for and make a couple of recommendations on good knives to consider. 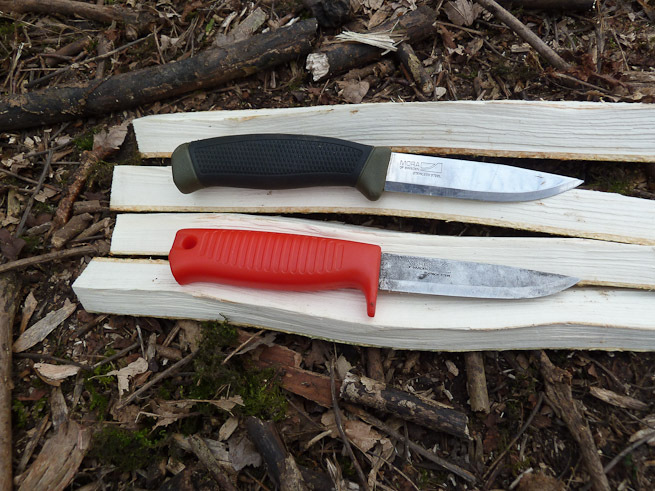 In our experience the best type of knife for practicing and teaching bushcraft is a simple fixed-blade sheath knife. A fixed blade knife is much safer than a folding knife as it cannot accidentally close on the hand of the user. It is also much more versatile in its application. 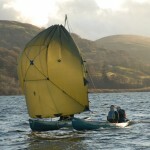 For example, you can use a fixed-blade knife for striking sparks from a fire steel or splitting wood using a technique called batoning. You can also make much more powerful, controlled cuts with a fixed blade knife. With a knife, control equals safety. Batoning with a fixed-blade knife. Photo: Barry Smith. Sparking off the back of the knife with a Swedish Firesteel. Photo: Barry Smith. 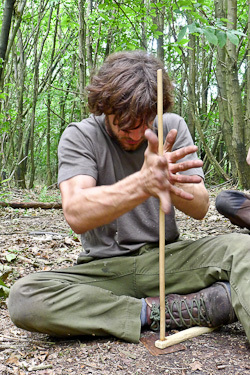 In executing bushcraft techniques our knife needs to perform a number of duties; carving, splitting wood, cutting cord and food, scraping with the back of the blade and piercing with the point. So at one end of the spectrum it needs to be thick enough and long enough to be suitable for battoning and at the other it needs to be thin enough to make the finer cuts used in carving. Luckily there are a number of good choices available that meet this criteria. When selecting a suitable knife we need to look for the following: Quality and reliability - The knife should be well made and robust. The part of the knife blade inside the handle (called the 'tang') should extend a good distance into the handle and be firmly fixed. The handle could be bolted to or moulded around the blade so that it is secure. Ease of sharpening - When learning to use a knife we also need to learn how to sharpen it correctly. There are three main characteristics of the knife which can impact sharpening: Blade shape - Overly curved blades can be harder to sharpen. Blade material - Carbon steel is softer and easier to sharpen than stainless steel but carbon steel is more prone to rust so needs greater care. My personal preference is to use a carbon steel knife but in my experience stainless steel knives fair better in the less caring hands of multiple users. If you are equipping a Scout Troop, for example, I would suggest you buy a few of each and see how it goes. Edge angle - There are different ways in which the sharp edge of the knife can be achieved. The simplest to sharpen are those with a single, flat bevel. This type is often referred to as a ‘Scandinavian’ or ‘flat’ grind and is simpler to sharpen because the flat bevel makes good positive contact with the sharpening stone. In terms of ease of sharpening - particularly with simple sharpening equipment when outdoors - this is preferable to a blade profile with several angles or with a very narrow bevel. Simplicity is best here. 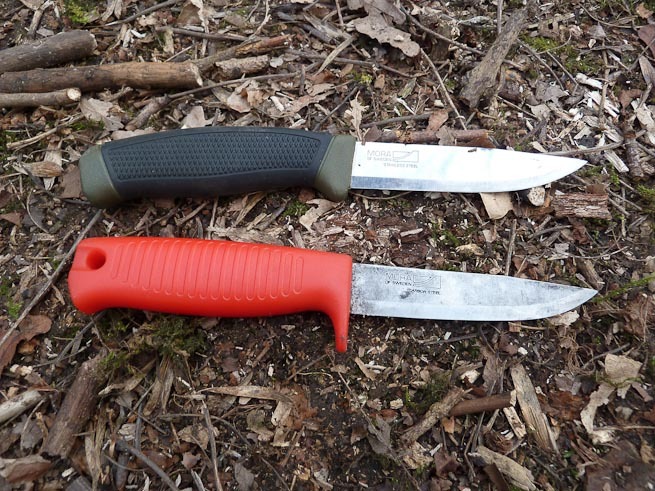 Safety features - We want our knife to be as safe as possible so there are a few additional considerations here such as handle design and sheath materials. Handle - needs to be non slippery, well secured to the blade and possibly have a finger guard depending on personal choice. Sheath - needs to be strong so that the user is protected from the blade when not in use and it needs to securely hold the knife to ensure it doesn't fall out. The sheath could be made of moulded plastic or leather as long as it holds the knife safely. Price - Thankfully we don't need to spend lots of money to get good quality knives that are suitable for bushcraft. We can (and do) buy very good knives for around £10-12 that meet all of the criteria described above and this brings us to recommended brands and models that are suitable for use. Mora of Sweden make some brilliant knives that are suitable. Their current ‘Adventure’ range caters for budgets from £10 to £50 whilst their ‘Construction’ range has knives starting as low as £5 which are fine for use in a Scout troop. The Mora Companion 840 (top) and Craftline Q 511 (bottom). Photo: Barry Smith. a leather strop to complete the sharpening process. Have a first aid or cuts kit close by. 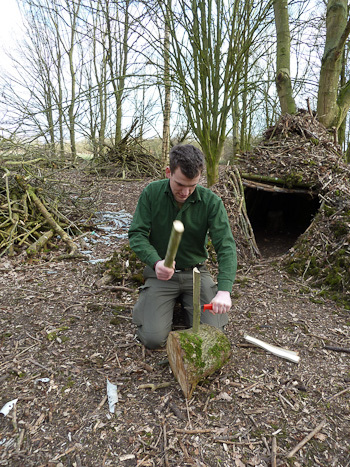 Barry Smith is a Scout Leader and was Frontier Bushcraft Courses Assistant from 2012 to 2013. Thanks for the great article. I was surprised to not see any children in the photos, I think that would have helped, but nonetheless the information is extremely useful. I’ll add one thing that was a major factor when I looked at outdoor fixed-blade knives for my two children (ages 7 and 9), and that was the grip or handle size. It’s great to look at knives from our perspective and test them out, but until you put it into th hands of a child you will not be able to see how well it works for them. My kids had much smaller hands than I imagined, the Moras were too big for my daughter (7). It sounds simple, but if I hadn’t taken them along with me to look at knives I would not have realized that it was a major factor in the decision process. Thought I’d share 🙂 Big fan of your blog! I just wanted to add my thanks for your kind words of support about our blog. We’ll do our best to keep delivering valuable information to you. Brian, thanks for your comments and thoughts on the subject. It is indeed a challenge to find a knife that suits young hands of varying sizes. We use the knives shown in the article for out Scout Troop with an age range of 10 – 14 and most of the children have no problems. Those with small hands can still use them but with more care. What knives did you end up buying for your Children? Barry, I ended up getting both Jack and Maggie an ESEE Candiru fixed blade knife. It’s not a bushcraft style (Scandi grind) knife, but it is perfect for their size hands and for learning basic knife skills and blade etiquette. I think it’s important for them to know how to make cuts, away form their body and body parts, as well as how to make the correct cuts. Thanks for your comment. A round-tip knife can help with safety and is an option for kids, particularly at the younger end of the age spectrum. Great read, thought I would add my comments in relation to first knives for young ones. Bought my 7 and 9 year old an opinel No7 kids knife with radius point. As my dad did with me, we started off sitting and down sharpening pencils to perfection prior to moving on to more complexity. Opinel a are are fantastic little knife to learn and appreciate locking and handling for safety and also learning to sharpen also. Both are now confident around there respective knives!! Anw nice post, i learn something from you to improve my blog.